Laygate eh!!!! Local rivals. Big stakes. Weaver to Wearer were a popular tailors in King Street in the 60s. Used to go there or Burtons for our suits, usually would buy at least two a year paying for them weekly. 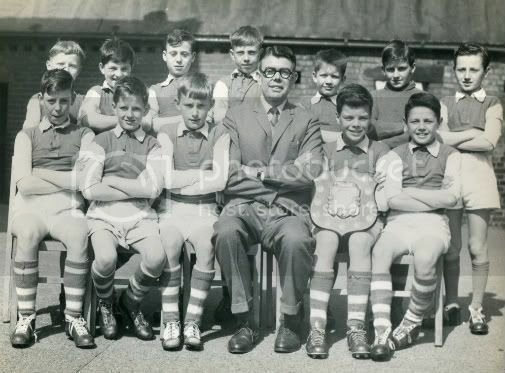 Here's another photo' of the Barnes Road Junior School team from 1961/62 season. We all look pleased with ourselves. I'm grateful to 'Pooter' for supplying the names. Back row: Leonard Whale, Malcolm Newman, Jimmy Dennison, John White, Peter Bruce, Trevor Auty, Alan Green. Front Row: Brian Hunter, David Adams, John Blake, Mr Galley, Barry Carr, John Sayers. Are you sure the Teacher isn't Ronnie Corbett.. Thanks for the pictures guys, I went to Barnes Road too, passed my eleven plus from there, and played football in the back lanes with Kellan and Pooter as well as Brian Hunter, Malc Newman (partnered to one of my wife's cousins now), Trevor Auty, and Ray Malcolm lived upstairs above me. I went to Barnes with all these lads and played footy and cricket with them as well,although Trev Auty was a year older.Would love to know what they're up to these days. Trevor Auty works for the Royal Mail and Malcolm Newman works for the council though I haven't seen them for years. I can just remember the winter of 47. We had gone to my cousin Nancy's wedding. The reception was in the Nook Winter Garden ( a much more refined place in those days) When we came out it had started to snow and my dad had to carry me. I can remember my school age cousins getting exotic stuff from Canada like tinned apple juice. We had relatives in Canada and America who sent us parcels of clothes, food and comics for me. It's hard to describe how bad things were after the war with food and coal rationed. Most people don't realise rationing went on until the mid fifties. Four ounces of sweets a week...no fat kids then. Yes the goodies came from Canada and passed out to the neady kids by the school,Lived in HS Edward st and climbed out of upstaire window onto the snow. Yes my cousins were from a single parent family which was quite uncommon then. They were classed as poor and got all the stuff through the school. We got stuff from my dad's aunts and uncles who had emigrated after the first war. We lived in South Eldon Street opposite St Mary's church. The Auty family lived just along from me but Trevor was a lot younger. Did you ever play on 'the Ash' I can vaguely remember a travelling fair used to turn up there. I played on the ASH most days and down by the Docks. On the Ash After the War they used to stack surplus life-boats and rafts ,great fun playing there.Yes a Fairground visited the Area,i did odd jobs in return for free rides.Then the hunt for pieces of bomb or shell very magnetic good to trade with at school. I recognise my husband John Sayer on both of these photos. Front row on the right , first photo, and sitting next to the lad with the shield on the second photo, long gone has the dark hair. I have a photo of Barnes Road taken by the Shields Gazette for an article about the shool closing down. I was one of the last pupils to attend Barnes. Maureen Stokes was headmistress at the time. I think i might have been there the same time , do you remember Joseph and his amazing technicolour dreamcoat which we did for cheviot road school when we had to go there when barnes road had the fire ? Anybody from this time remember Denise Graham , Christopher Saleh or Kevin Powell .